Laughing Moon Silverado Corset and how I wore it out to a see a play! 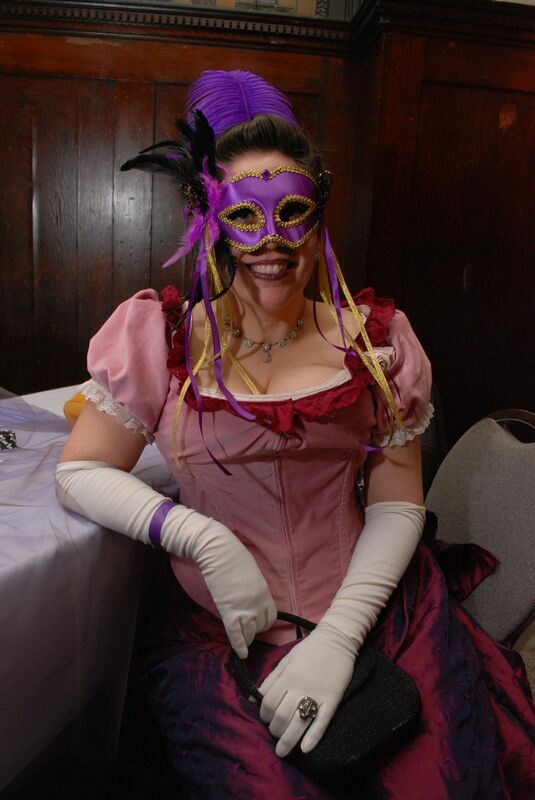 Then, last week I decided I would finish the corset and bind it. I still want to add flossing but I’m taking it easy for now. 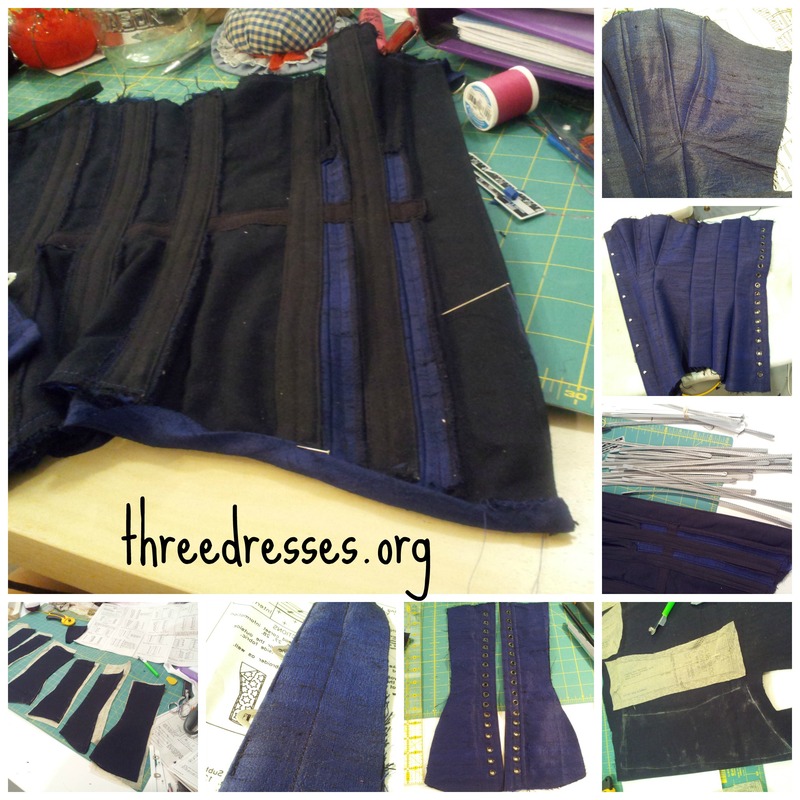 Here are some pics of the corset in different stages of completion. I used the Laughing Moon Silverado corset (this is the site I get all my corsetmaking materials from) and followed Truly Victorian’s suggestions on how to choose a size. I highly recommend both LM and TV. Incredible patterns. The bodice from the pic above is this Truly Victorian pattern. The bustle I’m wearing under my skirt is TV101– yup, also Truly Victorian. I’m planning on making another bodice for next winter’s ball so I’ll talk about it after I make it. More pics of the finished corset. The corset was made of a navy blue silk dupioni, underlined with a black coutil. I will never make a corset out of anything but coutil. It’s such a great fabric. I used spiral steel boning which is also my favorite. Once I had my corset bound I felt comfortable wearing it on the outside of my clothes. For this photo shoot I wore the same clothes I wore to the musical I went to last weekend called Zirkus Grimm. The show inspired my wearing a corset and all. Why am I straight faced in all these pics? I have no clue! Let’s call it intense? Or BRF? Whatever. It works. haha! I should also mention that the cropped jacket is from Burda magazine 12-2012. Here’s the line drawing. It’s not on the BurdaStyle site right now, in case you were curious. You can see that I didn’t add the peplum. I had every intention but kept putting it off until I decided to wear it with this outfit. The fabric is poplin with a border of an eyelet. I have more yardage in a deep purple. One more thing: SHINY PANTS!! Vogue Fall 2013…the few I’m liking. Wow. Just, wow. Really impressive work! You look AMAZING. Look at those curves, lady! You look hot! Thanks. I do love what a corset does to my body…oh, and a corset made to your measurements is totally comfortable. WOW. Just WOW. You look amazing!!! Wow! You look great and that corset is wonderful. Love how you styled it too! Thanks! I dragged stuff from the closet at the last minute but it did work, eh? All the pics! This? Is so luscious. You are one curvacious lady. hehe, thanks! And thanks for pushing me to use a lot of pics. I love your corset and completely agree with you about the steel boning. There is no other way to construct a corset (at least not a good one). I use spiral steel myself. It makes a world of difference in comfort. The first corset I made was out of two pairs of old jeans but I still used spiral steel boning. Gosh, you make me wish I could wear a corset without looking so shapeless! You look so great in it! And I absolutely love how you added all the modern pieces with it to make it so everyday wearable! I tried making a corset for a friend who fits into an S curve corset much better than this kind I made but because I made it to her measurements, she looks as straight up and down as she would without a corset. I offered to add padding but she didn’t want it. Guess you just have to do it if you know it’ll create the shape the person wants. Anyway, I like the style with the tabs at the bottom to keep your farthingale from shifting.I like these patterns, http://www.margospatterns.com/Products/ElizUndpn.html though when I made mine I had to draft it myself. The heavy wide boning and busks work best on these rather than the spiral bones. If you don’t bone your bodice, at least bone along the lacing holes to keep it from buckling. I read a great article once about cording a bodice instead of boning it. If you cord the already made bodice that would give you some support plus take it in. Peasant clothes is much more practical and fun, the higher up in status you go the more restrictive the garb! WOW – that corset looks fantastic on you! You look great in that costume too! I’m so impressed with your corset! 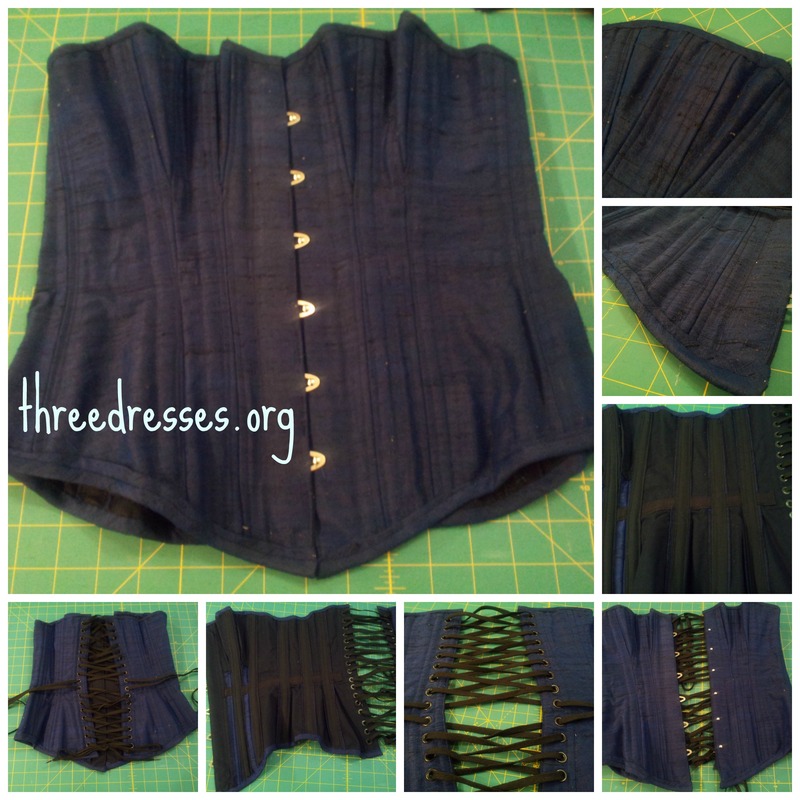 Have you thought of making a striped corset? Just a thought…. Thank you! I’ve thought of using like a ticking or something striped to get a chevron look but recently I got this idea to use different colors for the fashion fabric of the corset. It uses so little fabric compared to most things I feel like I could try anything. I’m always impressed by anyone who takes on the making of a corset – it looks so fiddly and intense! Your corset looks amazing – what a great shape. I’d say you should be as precise in corsetmaking as you would be with quilting. The difference with corsets is that you get the gap in the back that you can rely on for weight changes and most garments don’t have anything like that. Thanks! Thanks. I sometimes find that costuming gets me learning new techniques that sometimes just aren’t covered in other clothes. What a beautiful corset Leila, it almost makes me want to make one. Especially after seeing your modern styling of it, very cool. Tiny top hat wheeeeeee! I know you’ll say you don’t have anywhere to wear it to buuuut corsets are fun and all you really need is one! I think that this is such a cool and frisky look- racy but not sleazy- you look great and your work is admirable! Gorgeous work. This is so inspiring. I really should get on with mine. I love this corset! Can you tell me what color and material you used for the lacing? Also, I have never heard of coutil until now.I will have to research it. I bought lacing from corsetmaking.com and used black as that’s what I had in my stash but blue would’ve been better. Your corset looks great. If you were to sell corsets on Etsy, how much would you price them?